You can do all sorts of things with music: remix them, mash them up with another piece of music, create a chiptune version of it ect. But what if you just increase the speed? That's exactly what SPEED UP >>> does: Pick up vgm tracks that sound good even when the speed is increased. First off, the music. I'll embed a few tracks here, the rest can be found on the YouTube playlist. One handy feature the RPG Maker has is to play a sound file with varying speed. I can play them as much as 50% faster or slower. If you experiment with your music, you might end up with something that can be used for another occasion, thus creating two tracks out of one for your game. I did the exact same thing for my game A Journey Too Kind where I speed up the level select music track up to 50% and use it as a mid-boss battle music. So I was thinking: Why not do so with other tracks? That's all that it took for me, and starting from the initial idea yesterday, I picked some of my favorite game albums and tried out some of the tracks if they're any good for the speed up process. Turns out quite a few qualified for this. I play a track at 50% increased speed, or 150% speed. If something is too hectic, it disqualifies. Sometimes a track sounds almost like a new, original thing, and sometimes it is just as awesome as before, but now in a different flavor. 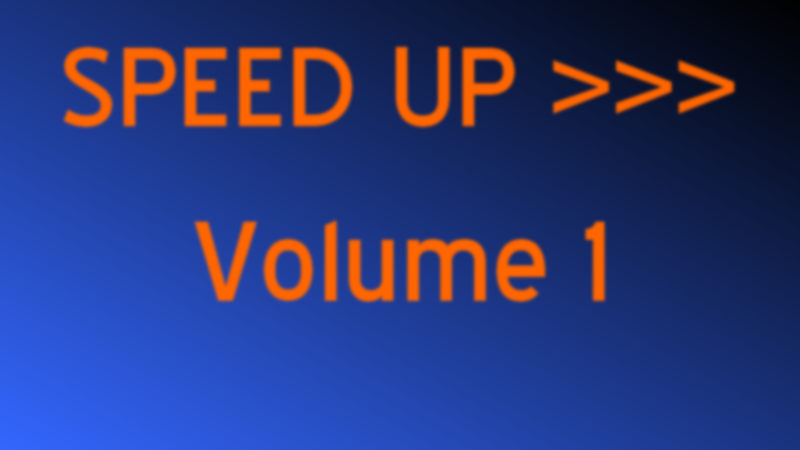 I arranged a total of 18 tracks for my self-made album I call "SPEED UP >>>". Let me know what you think about this experiment. If you like this sort of music, I'll work on a second volume.